When looking for top quality accessories for your Honda car, truck or SUV, make sure to visit McConnell Honda in Montgomery, AL. 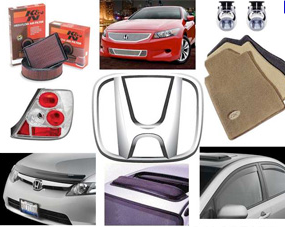 We have a great selection that will help you personalize your vehicle with the best Honda accessories on the market. From sports grilles to fancy spoilers, we have the Honda accessories you’ve been searching for. Be sure and ask about the latest MUGEN top performance accessories available for most Honda models. Pet owners love the special new Dog Friendly Element Kit which lets your pet travel in style and enjoy the true meaning of comfort! Every top quality auto part and accessory is available on the internet with our Montgomery Honda Accessory Store. We’ll keep track of your order and let you know upon its arrival.